There is so much to love in this trailer, starting with that sad, mournful, piano score. Maybe the only thing I don’t like about this is that it reminds me Rogue One is going to be in 3D. 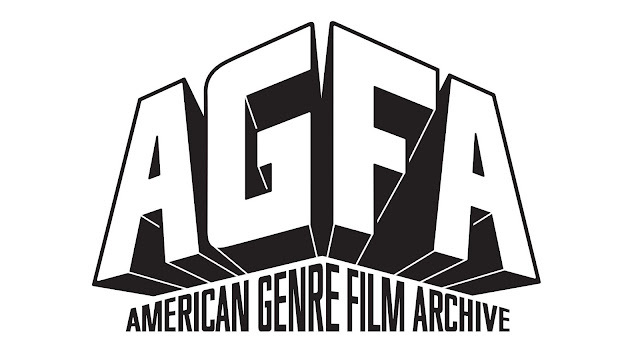 It’s cool that, for a second straight time, we’re getting a Star Wars movie a female protagonist. (It’s like they finally got the memo that women like Star Wars, too. Crazy, I know.) At the same, time, Felicity Jones’ Jyn Erso isn’t just a carbon copy of Daisy Ridley’s Rey from Star Wars: The Force Awakens. 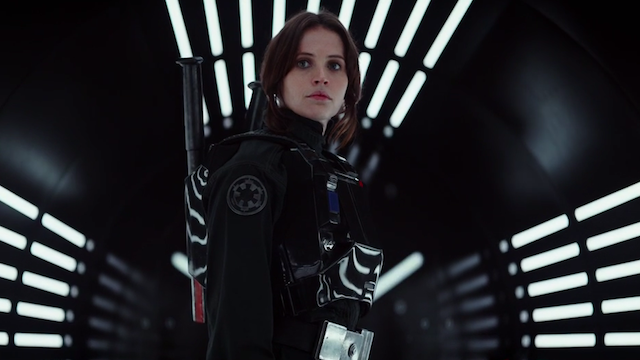 Jyn shares more DNA with a character like Han Solo than anyone else, full of cocky swagger, grit, and badass attitude. I can’t wait to see more from her, even if that, “This is a rebellion, isn’t it? I rebel,” line is super cheesy—but it’s cheesy in that perfect Star Wars way. 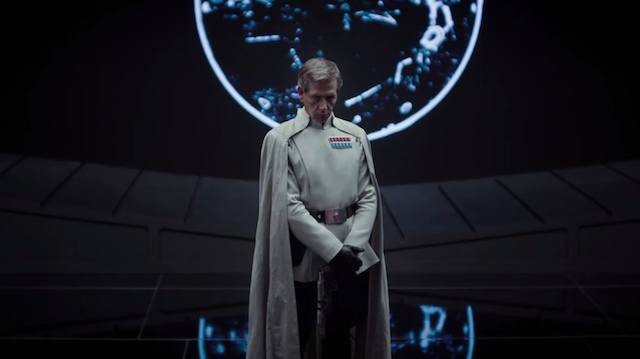 Ben Mendelsohn as the villain, some as-yet-unidentified Imperial officer, looks fantastically sinister in that long, flowing white cape—these images have been described before, but seeing them for myself is something else entirely, as if I wasn’t stoked for him to begin with. 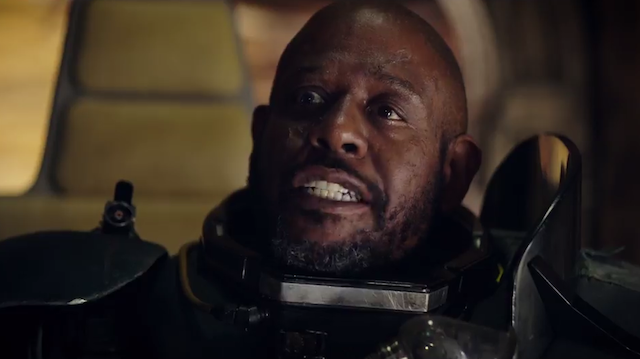 It’s been said that the Star Wars Story movies like Rogue One won’t revolve around the Force like the Episodes, but that doesn’t mean there isn’t room for a wise, sage-like figure, filled out here by Forest Whitaker, funneling Ghost Dog into that far, far away galaxy. There’s still no clue about the identity of Diego Luna’s character (I still don’t think it’s Biggs Darklighter, sorry, everybody), and we don’t see Mads Mikkelsen’s character at all, or Alan Tudyk’s droid for that matter. But I don’t care about that because of two words: Donnie Yen. 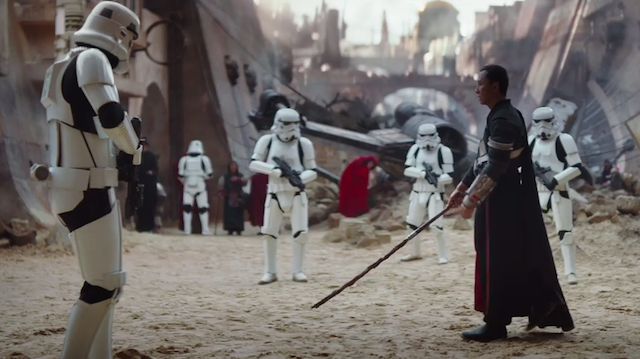 It’s going to be un-freakin-believable to watch one of the great cinematic martial artists of all-time ply his trade in a Star Wars movie, and hopefully what we see here is just a taste of what’s to come in Rogue One. With director Gareth Edwards’ big, sweeping, spectacle chops on full display, we’re starting to see why, in addition to being called a heist movie, Rogue One: A Star Wars Story has also been likened to gritty war tales. 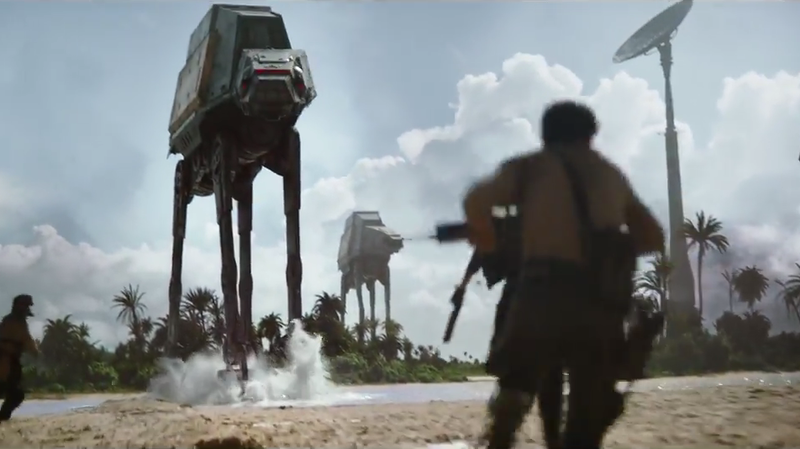 There are massive, potentially vicious battles in store for fans in the very near future, and with those black stormtroopers and AT-ATs on the ground, the Rebellion is in for some tough times, with crazy, shriek-y, Godzilla-style sound effects. Admittedly, as cool and ominous as it is to watch the construction of the Death Star, it’s hard not to look at Rogue One as yet another Star Wars Death Star Movie. We’ve already done this three times—Starkiller Base in The Force Awakens is, in reality, another Death Star; a bigger, badder one to be sure, but it still follows the same mold. This is a relatively minor quibble considering how incredible the rest of this trailer is, and I get that this shows a different side of the story, but Mon Mothma talking floating, planet-sized battle stations, it just feels like we’ve been here a time or two already (and we do already know how this story ultimately ends). Not that I won’t still be the first in line opening day. Rogue One: A Star Wars Story opens everywhere December 16. "At the same, time, Felicity Jones’ Jyn Erso isn’t just a carbon copy of Daisy Ridley’s Rey from Star Wars: The Force Awakens. Jyn shares more DNA with a character like Han Solo than anyone else, full of cocky swagger, grit, and badass attitude." How badly I wish this had been true. I LOVED "Rogue One," but one of the few things I did not love was Jyn. Her backstory was interesting, but her personality felt like the most watered-down copy of Rey they could've possibly cooked up. Right down to the accent. They couldn't even give her a different hair color. Other than that the movie was awesome. I didn't have quite as strong a reaction to Jyn, but, admittedly, she's not quite what I hoped for and there definitely could have been so much more. With all of the footage from the trailers that didn't make it into the final film and all the reshoots, I wonder how much her character changed in the editing process. I hope there's a version out there where she has the edge and attitude that fulfills the promise of what's in the trailers, one that's less, as you say, watered down. But I agree, overall, I totally dug Rogue One.